Meet the LightCaster™ W-DMX® 2.4 GHz wireless DMX system. A typical setup would consist of a Lightcaster™ WDMX™ Transceiver (to transmit signal) and at least one LightCaster™ W-DMX® Receiver to receive the signal. Users can expect an outstanding wireless range of up to 500 meters (line-of-sight) for any of their DMX512 compliant equipment, and leave any worries behind concerning loss of signal due to its built-in FHSS technology (Frequency Hopping Spread Spectrum). 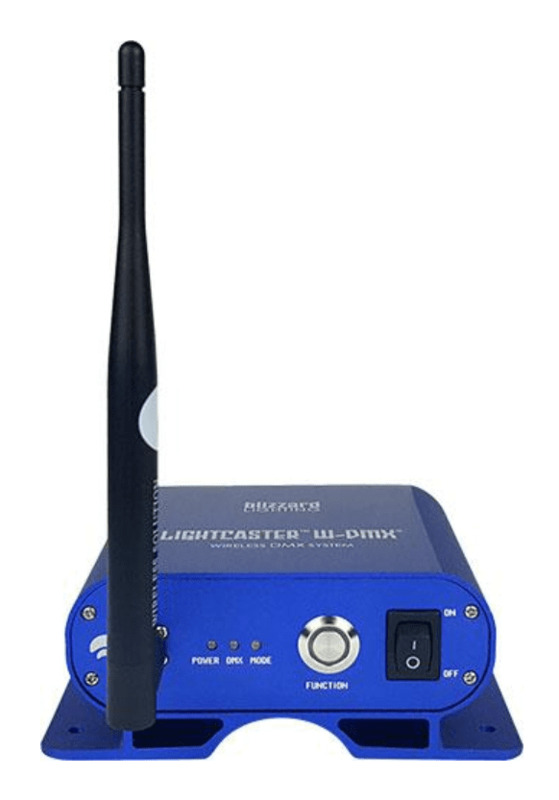 Setting up wireless DMX with the LightCaster™ W-DMX® is a very simple procedure. Each of the units have a single function control button, plus a power, DMX, and mode status LED indicator. Each unit also features an integrated clamp for mounting to 2" truss, is housed in a durable anodized aluminum casing, and is equipped with a powerCON® compatible power connection.